We started offering this Cruel Girl jean when it first began. We thought the name was real catchy. Especially after having raised my oldest daughter through teen years. (She became human again at about 20!) What began as a basic jean with a nice name has evolved into a very fashion forward brand of jeans that cross over from Western into almost all markets. With the new rise (waist height) program, there is a jean for every body type. If you have never worn Cruel Girl before, don't be afraid to try a couple pair. Cultured Cowboy will be glad to send you a fit or two, or three, so you can try them out and find your best "friend". Those that do not work well can be returned. What a bunch of confident people we are! Really, they are this good. If you know your size, and are familiar with Cruel Girl, you know how quickly some of the styles sell out. You may Pre-Order any that you like. Your Credit Card will not be billed in full until about the time to ship! Almost like an Internet Layaway plan. This way, you can be assured of getting your favorites. The new Cruel Girl Rise Guide provides a snapshot of the various jean rises available within Cruel Girl Jeans ' assortment of styles. All over the TV Networks, fashion is showing a plethora of rising jean waistlines. This season, there is something for everybody! 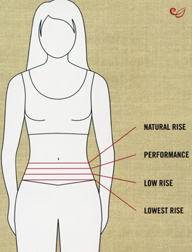 Ride and work in higher waists; Have a night on the town in whatever waist you feel most comfortable! Both Boot Cut and Straight Leg are "in". Fit Details: Performance Rise, Slim or Relaxed Hip, Slim or Relaxed Thigh, Slightly Tapered Leg, 15.75 inch bottom. 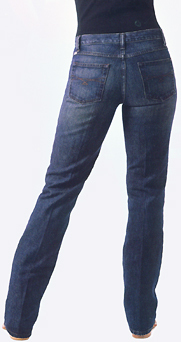 Low Rise Jean Slim Fit Style # CB51053003 IND Limited selections of sizes left. Low Rise Jean Relaxed Fit Style # CB51052003 IND Limited selections of sizes left. RACHEL The Hottest Riding Jean offered in Heavyweight 14.25 oz denim - Dark Stonewash. The CRUEL GIRL Rachel riding jean is offered in a premium Heavier cotton denim. We brought it back to you in a dark stonewash finish in both slim and regular fits. The same great Rachel back pocket stitch, with a comfortable performance rise, highlights this Straight Leg. Finished with eye-catching hand sanding, whiskers and tint in just the right places. Fit Details: Performance rise, Slim or Relaxed Hip, Slim or Relaxed thigh, Straight Leg, 16.5 inch bottom. Fits over your boots. Rachel Slim Style # CB65053001 IND Limited selections of sizes left. Rachel Relaxed Style # CB65052001 IND Limited selections of sizes left. RACHEL RIGID Another Hot Riding Jean offered in Heavyweight 14.25 oz denim - Dark Stonewash. The CRUEL GIRL Rachel riding jean is offered in a premium Heavier cotton denim. A fabulous fit and another enticing new finish. Dark stonewash in both slim and regular fits. The same great Rachel back pocket stitch, with a comfortable performance rise, highlights this Straight Leg. Finished with eye-catching hand sanding, permanganate, whiskers, tacking, grinding and gray tint in just the right places. Rachel Slim Style # CB65053003 IND Limited selections of sizes left. Rachel Relaxed Style # CB65052003 IND Limited selections of sizes left. RACHEL STRETCH The Hottest new Riding Jean offered in Stretch material. The CRUEL GIRL Rachel riding jean is now offered in a premium stretch denim. This stretch jean has received lots of fans. We brought it back to you in a dark stonewash stretch finish in both slim and regular fits. The same great Rachel back pocket stitch, with updated thread colors, highlights this Straight Leg jean. Finished with eye-catching hand sanding, whiskers and contrasting embroidery. Fit Details: Performance rise, Slim or Relaxed Hip, Slim or Relaxed thigh, Straight Leg, 16.5 inch bottom. Rachel Stretch Slim Style # CB65053002 IND Limited selections of sizes left. Rachel Stretch Relaxed Style # CB65052002 IND Limited selections of sizes left. Cruel Girl presents the Dakota Riding jean in 11.75 oz Stretch denim. Made with an ideal combination of comfort and style, this ladies jean caters directly to women who ride. 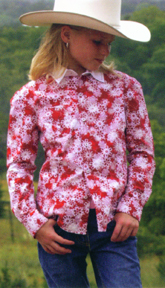 Every aspect of the fit and style are designed with cowgirls, Western pleasure riders, and motorcyclists in mind. The many steps of dye, over-dye, stonewashing, then hand sanding, give a feel that makes this jean a real value. Fireworks back pocket stitch and new rose hardware. Fit Details: Performance Rise, slim or relaxed hip, slim or relaxed thigh, boot cut leg, 17 inch bottom. Finish Details: 11.75 oz Stretch Denim, Medium Stonewash, Hand Sanded, Fireworks Pocket Stitch, Rose Hardware. Dakota Stretch Slim Style # CB61453073 IND Limited selections of sizes left. Dakota Stretch Relaxed Style # CB61452073 IND Limited selections of sizes left. DAKOTA - Heavy weight Riding Denim Jeans. Cruel Girl presents the Dakota Riding jean in 14.25 oz Light Stonewashed denim. Made with an ideal combination of comfort and style, this ladies jean caters directly to women who ride. Every aspect of the fit and style are designed with cowgirls, Western pleasure riders, and motorcyclists in mind. This ladies jean is definately needed in your wardrobe! Fireworks back pocket stitch and new rose hardware. Finish Details: 14.25 oz Denim, Light Stonewash, Hand Sanded, Fireworks Pocket Stitch, Rose Hardware. Dakota Slim Style # CB61453074 IND Limited selections of sizes left. GEORGIA PAGEANT JEAN Made for custom dyes. The Georgia jean is now made in a more natural finish, ready to use your favorite liquid dyes to match show clothes, a favorite blouse, or whatever. Be inventive, tie dyes, color splotching, self-expression can "rein" supreme! When all the colored Rockies stopped being made, there was a void in colorful denim bottoms. Cultured Cowboy bought up all we could find, and has been slowly reselling them to anyone who needed a higher rise colored jean. Now, you can get the latest lower rise in a natural to dye yourself. Georgia fit. Your choice makes this jean a real value. Fit Details: Low Rise, slim or relaxed fit hip, slim or relaxed fit thigh, boot cut leg 17" opening. Finish Details: 14.25 oz Denim, especially prepared to take your dye. Pageant Jean Slim Style # CB31153001 PFD Slim fit dye ready. Limited selections of sizes left. Pageant Jean Relaxed Style # CB31152001 PFD Relaxed fit dye ready. Limited selections of sizes left. One of the most requested styles is also available in black. An over-dye fashion black jean in 13oz denim. Made with an ideal combination of comfort and style, this ladies jean caters directly to women who want to turn heads and still be comfortable. Choose your slim, or relaxed, fit with all the same details of the original Georgia jean. Tonal back pocket stitching. Georgia Black is the dressy jean, the motorcycle mama jean, the just looks great anytime jean. You'll want more "party time", just so you can wear it more often. Fit Details: Low Rise, slim or relaxed hip, slim or relaxed thigh, boot cut leg, Finished outer leg kick slit. Finish Details: 13oz Black Over-dye Denim, Rinse Finish, Rose Hardware, Black Tonal Rear Pocket Stitching. Georgia Black Slim Style # CB51253008BLK Limited selections of sizes left. Georgia Black Relaxed Style # CB51252008BLK Limited selections of sizes left. One of the most requested styles is still available. Choose from dark stonewash sandblast, or medium stonewash sandblast. A fashion denim jean that has many details in the finish. The dark stonewash has an ever so comfy feel with the specially woven 13.25 oz stretch denim. Ditto the medium stonewash (13.25 oz weight) that replicates the dreamy fabrics in designer shops. Made with an ideal combination of comfort and style, this ladies jean caters directly to women who want to turn heads and still be comfortable. Choose your slim fit, or relaxed fit, with all the same details you love in Georgia jeans. Back pocket stitching. Fit Details: Low Rise, slim or relaxed hip, slim or relaxed thigh, boot cut leg, finished outer leg slit, 17 inch bottom. Finish Details: 13.25 oz Denim, Hand Sanded Finish, Rear Pocket Stitching. Georgia Dark Stonewash Slim Style # CB51253010 IND Limited selections of sizes left. Georgia Dark Stonewash Relaxed Style # CB51252010 IND Limited selections of sizes left. Georgia Med Stonewash Slim Style # CB51253001 IND Limited selections of sizes left. Georgia Med Stonewash Relaxed Style # CB51252001 IND Limited selections of sizes left. One of the most requested styles is still available. Dark stonewash sandblast. A fashion denim jean that has many details in the finish. The dark stonewash has an ever so breezy feel with the specially woven 11.50 oz stretch denim. Made with an ideal combination of comfort and style, this ladies jean caters directly to women who want to turn heads and still be comfortable. Choose your slim fit, or relaxed fit, with all the same details you love in Georgia jeans. Back pocket stitching. Finish Details: 11.50 oz Stretch Denim, Sandblast Finish, Rear Pocket Stitching. Georgia Stretch Slim Style # CB54753001IND Limited selections of sizes left. Georgia Stretch Relaxed Style # CB54752001IND Limited selections of sizes left. Pic above shows side details (but light stonewash color is off). Low rise in a nice light bleach stonewash, then sandblasted. Boot cut with a finished outer leg slit. Just the right kiss of faded glory in all the right places. 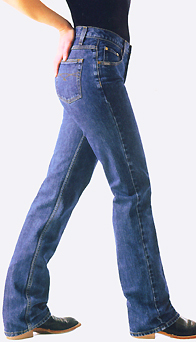 After the dye process, the jean is lightly bleached. The bleach is counteracted to stop the fade at just the right point. Then, sandblasted to soften more. Then, grinding finished the distress comfort of your Kelsey. Wow, what a lot of work to make your pants! 13.25oz denim. Nice back pocket stitching. Button Fly. Fit Details: Low Rise, slim or relaxed hip, slim or relaxed thigh, boot cut leg, 17.25 inch bottom, finished outer slit. Finish Details: 13.25oz Bleach Stonewash Denim, Sandblast Finish, Distressed, Grinding, Button Fly. Kelsey Bleach Stone Slim Style # CB56853001 IND Limited selections of sizes left. Kelsey Bleach Stone Relaxed Style # CB56852001 IND Limited selections of sizes left. Kelsey Medium Stone Slim Style # CB56853002 IND Limited selections of sizes left. Kelsey Medium Stone Relaxed Style # CB56852002 IND Limited selections of sizes left. Lowest rise for those who request it! Made in a fabulous dark stonewash denim, all the favorite features you have come to enjoy in a Cruel Girl jean, are incorporated here. Wide cut straight leg stylishly goes over your boots. Just a touch of embroidery on the front, to complement the rear. Fit Details: Lowest Rise, relaxed hip, relaxed thigh, Straight cut leg, 19.50 inch bottom. Finish Details: 12 oz Dark Stonewash Denim, Front pocket embroidery, Whiskers, HAnd Sanding, Grinding. Lowest rise in a nice dark stonewash, then hand finished. Boot cut. Just the right kiss of girlish glory in all the right places. Brittany has been a fashion staple for a couple years now. Nice back pocket stitching. Nice all around fit. Fit Details: Lowest Rise, slim or relaxed hip, slim or relaxed thigh, boot cut leg, 17.25 inch bottom. Finish Details: 12 oz Dark Stonewash Denim, Whiskers, Hand Sanding, Grinding, Permanganate. Cruel Girl has some of the best jeans for girls, as well as for their Moms, and older sisters. Styles are similar to the pics above. Yet, each style is cut for a growing girlish figure. While they are still in the "girl's vs boys" years of life, let them wear a winning jean - Cruel Girl! Straight Leg fits over a boot top. Are you really wearing JEANS, or is it ART? It is probably best to turn your jeans inside out, and fasten them, to wash them. Most washing machine makers are recommending this. Wash on a gentler cycle for a longer period of time using cold water for best results in keeping them looking as new as possible. If they are really muddy, squirt 'em off with a hose, then kinda half hand wash them before you ruin a load of clothes with all that hair and mud. Once the bad stuff is off, then put those jeans in the washer. Momma will really appreciate your efforts! Dry, but don't over-dry a lot. This keeps the fabric stronger. Take them out as soon as they finish and you may be able to skip ironing, (except those show pants). You can lightly steam out the wrinkles with one of those laundry steamers, or iron as you see fit.